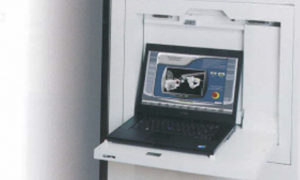 The INTEGREX e-H Series encompasses machines that are a complete fusion of CNC turning centers and machining centers. 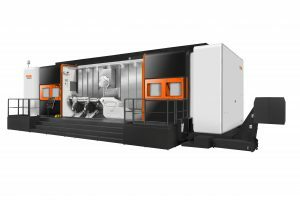 This combination allows for completing all part operations in single setups – turning, milling, drilling and more with Mazak’s DONE IN ONE® machining concept. The advanced B-Axis milling spindle design with Y-Axis capability is available on all models. 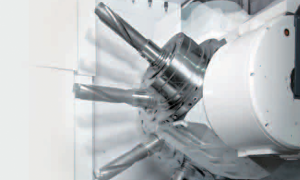 Machine configurations can include second turning spindle (S) versions and those with lower turret (T) rotary tool spindles on the ST machine models. 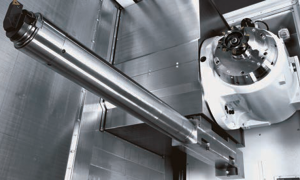 The unique long boring bar system is extremely effective for the inner diameter and deep hole machining of large workpieces. Up to 3 boring bars are stored in the stocker located over the tailstock. The INTEGREX e-670H II automatically changes the boring bar heads which are stored in the standard tool machine.